Well, after a few years on this forum, I figured it was time to finally get around to putting up my bio. I’m fortunate to be a part of a very active brew club. We aren’t very big, but have a great core group that does a lot: we run a local Big Brew event, teach an annual homebrew class, have numerous group brews every year, actively help each other with becoming better brewers, and run our local county fair Homebrew Contest which is a sanctioned AHA event. However, the thing I’m most proud of is that our club does a quarterly Charity Tap Takeover at Riverport Brewery. We brew a bunch of beer and serve it at the brewery with all the money going to a local charity. It is always well received and is a great way for us to give back to our community! I did my first batch in 1997 while in college in Auburn, AL. A couple classmates of mine were home brewers and all it took was tasting their beer to decide I needed to start. I helped them with a few batches to learn the process, bought a few books, and was hooked! A few... not using a blowoff tube for big beers is one I keep doing for some reason. Took a few messes to finally get in the habit of using one. However, not even a blowoff tube always works (see below)!! The scariest was dropping an empty glass carboy onto the tile floor of my bathroom while barefoot. Glass everywhere, but somehow I didn’t get cut. Lessons learned? Get rid of the glass and don’t brew or clean up while barefoot!! I’ve learned to “never say never”. I used to swear I would never, ever, brew a sour beer. Why would anyone want to do that to beer? Well, after trying a few through our club and at NHC Seattle in 2012, I’m hooked on sour beer. 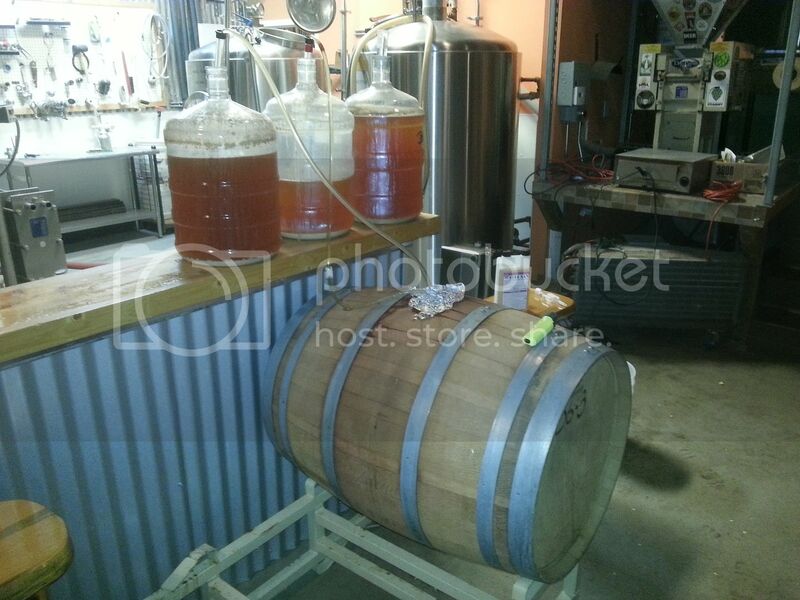 I’ve brewed many sours since then and our club now has two 60gal wine barrels for sour beer: a Chardonnay barrel with a sour blonde (pic below) and a Cab Sauv barrel with a Flanders Red. I don't know why, but I tried to make a fruit beer using a pale ale kit and adding blackberries. It was a comedy of errors...major boilover, tried to sanitize the berries using hot water but ended up cooking them, sanitation was probably a bit iffy.... It turned out looking like a strawberry shake (reddish and milky appearance) and was way overcarbonated. Amazingly it actually ended up tasting pretty good. I drank every one of them! Hmm, maybe this should go under the homebrewing disaster question. Other than my first beer, I forgot to put the false bottom in my mash tun one time. I got mad and just dumped the whole mash tun into another container, installed the false bottom, and dumped it all back in. I was sure it would be completely ruined, but it turned out to be one of the best APA’s I’ve ever made. No, but hope to be some day. Nothing special, just some of the same stuff everyone else does: good sanitation, wort chiller, yeast starters, temp control, etc. I just finished building a dedicated temp control chamber with dual stage controller. I was using an old fridge, but that now houses all of my bottled homebrew and commercial beer at cellar temps. Having a proper dual stage temperature control system is awesome and has definitely helped improve my beer. Plus, now I can start laagering! 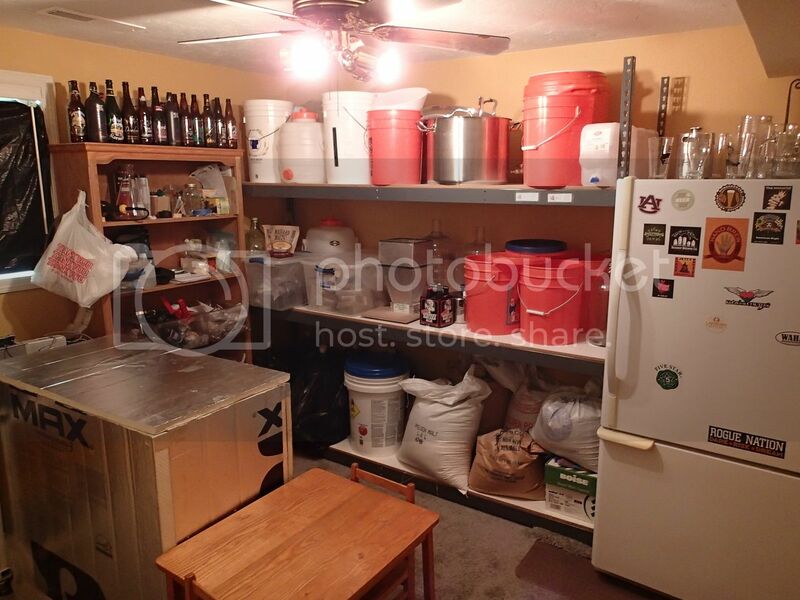 Mostly alone, but our homebrew club brews together a few times a year for club experiments, Big Brew, etc. Also, my wife helps sometimes. She is the most awesome wife a homebrewer could have! She loves my beer, encourages me to brew often, has no problem with me using an entire bedroom to store all of my brewing stuff, and is even a member of our homebrew club! I moved up to all grain brewing in 2010. 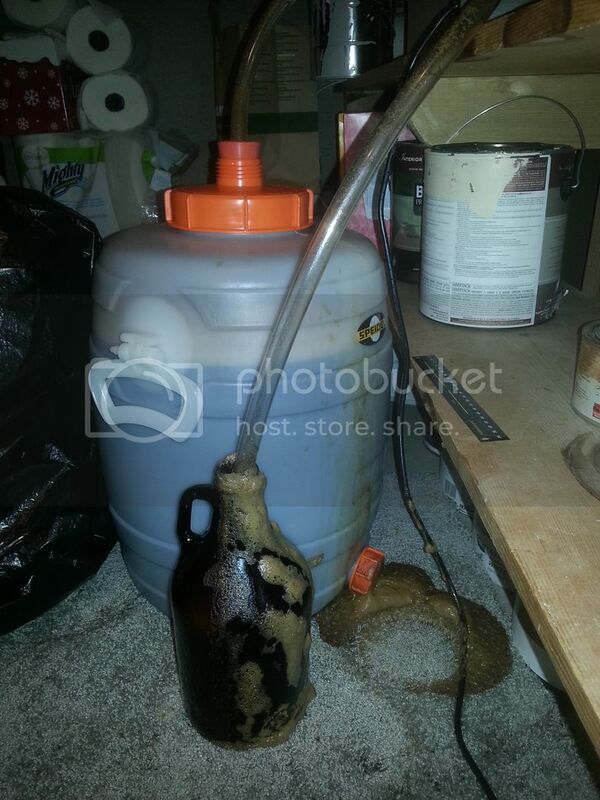 I use 10 gal Rubbermaid drink coolers, a 10gal SS brew pot, and a Blichmann burner. Also have a 5gal Rubbermaid set-up for making smaller batches. I boil on the back deck and ferment either in a basement closet or my new temp control chamber. I built a 5-tap kegerator using a chest freezer with temperature control, a full size refrigerator for bottled beer, and have an entire spare bedroom dedicated to storing all of my brew stuff! I also have a 15 gallon whiskey barrel I'm using to age a Belgian Dark Strong. It comes and goes, but I have brewed @ 20 batches in the last year. I usually brew a bunch from fall - early spring, and then don’t brew for a few months during the summer when I am really busy with work. Mostly do 5 gal batches, with a few 2.5 gal test batches thrown in. My favorite is Riverport Brewing Co. across the river in Clarkston, WA. It was started by a couple of local guys, and has really taken off. They have a bunch of great beers, but my favorites are their IPA’s and Bock. The setting couldn’t be better with the tasting room inside the brewery, and the deck has a great view of the local hills and the Snake River. They even help local homebrewers out by ordering grain for us and selling us bulk grain and hops at cost. They even let us grab fresh yeast from the fermenters. It’s amazing how fast fermentation starts when you use a nice fresh pitch of active yeast! Golden Promise. Just love the richer taste and greater depth of flavor I get from it for my Scottish Ales. Don’t really have a “house yeast”. 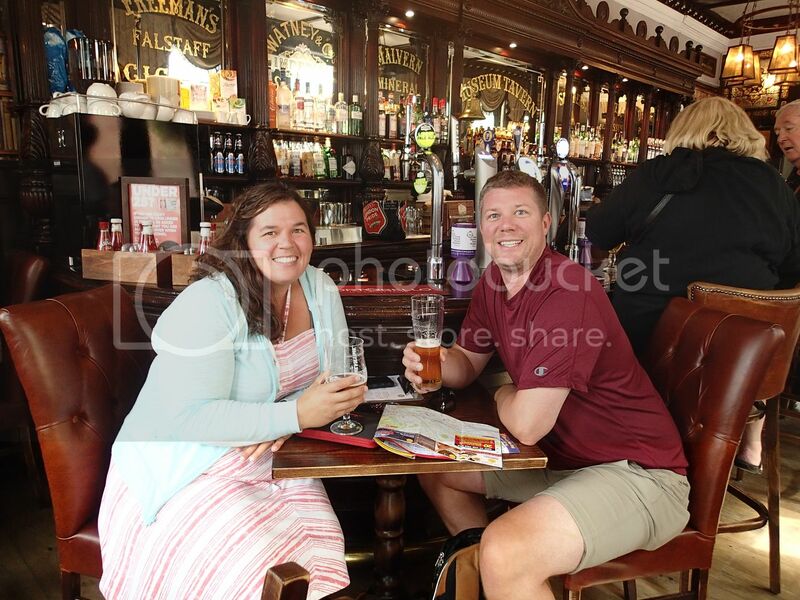 My favorite is probably WY1728 Scottish Ale since I use it in my favorite beer. However, I most often use WY1028 London and US-05. A few years ago a new brewer brought in his first beer, which several club regulars helped him make. Well, it turns out they used a brand new garden hose to fill up their pots for brewing water. The resulting beer had the strongest “garden hose” taste you can imagine!! We all had a really good laugh about it, and the guy took it pretty well. Fortunately, after an extra month of aging the hose taste disappeared. Also, our homebrew club always seems to pick the coldest day of the year every year to do a club brew day. In February 2014, we ended up brewing on a day where the high temperature was 6°F! It was a blast, but the guy whose house we brewed at ended up with a solid sheet of ice on his driveway. I was fortunate enough to be a co-brewer with Kyle Schmitt on his NHC gold medal winning Dopplebock in 2014!! I have won a number of ribbons at our county fair competition, including BOS in 2009 for my RIS, and BOS and runner-up BOS in 2012 for my Dusseldorf Alt and Scottish 80/-. Now I am a co-organizer and judge (non BJCP) for our county fair competition so I don’t enter very much. I was an indoor brewer until all the condensation from boiling on the stove burned out my over-the-stove microwave in 2013. $200 in repairs convinced me it was time to buy that Blichmann burner I had been drooling over and move outside. No, but I do have an awesome brew cat! Meet Zita, my Persian brew assistant. 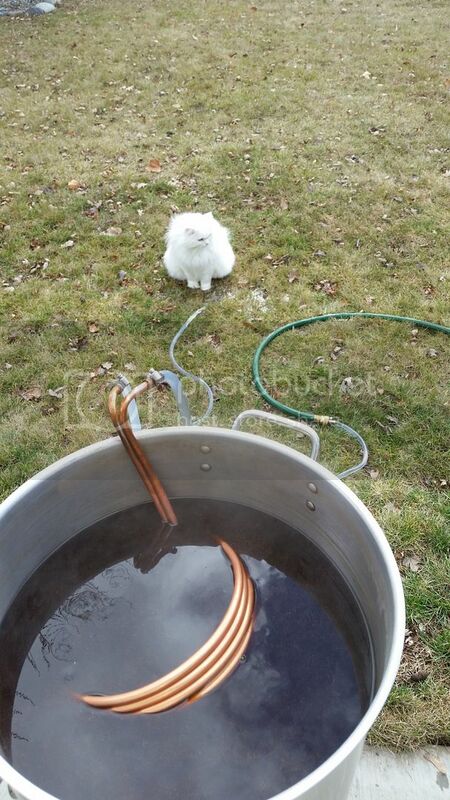 She loves hanging out with me when I brew, and even sits in the water while I’m chilling my wort. Welcome Robert ! Great job on your bio. 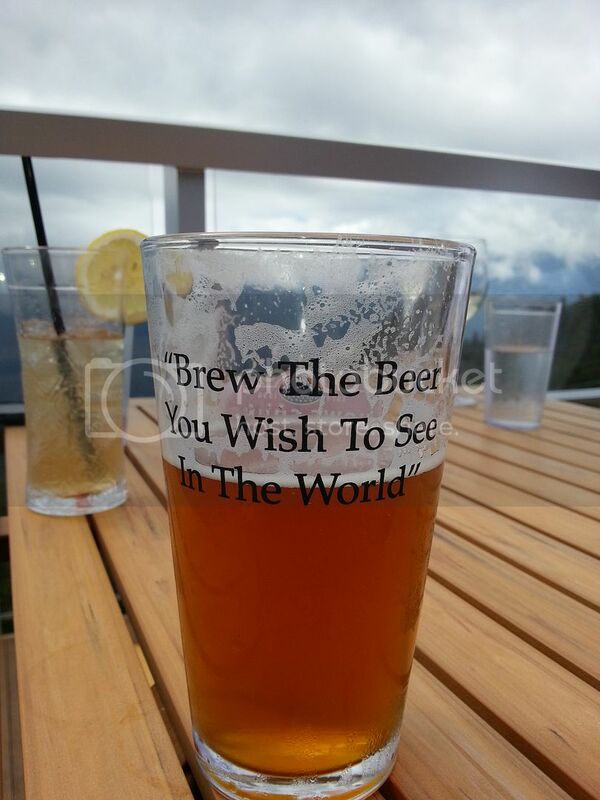 Cool slogan on the pint glass. Thanks Jon! I can't take credit for the pint glass. It was at the Summit Restaurant at the top of the Sea to Sky Gondola north of Vancouver, BC. Great beer and great view! Greetings from Goldendale. I dig your community, beautiful area, especially the Lolo Pass Hwy! Hi Jim! It is definitely a neat town. I've been here 13 years now and have no plans to move ever again! Highway 12 up the Clearwater and Lochsa Rivers to Lolo Pass is stunning. I am so lucky to live and work in such a beautiful area. I enjoyed reading your bio very much, Robert. Welcome! Great bio, enjoyed reading it! Good to see Robert. See you Saturday at Rport for big brew. Welcome, Robert. Awesome job on the bio, great pics! Thanks everyone! I'm happy to be here and glad everyone enjoyed reading my bio!